The murderous lovers found each other in the slums of Depression-era Dallas and embarked on a wild crime and killing spree - so why is it their love that sustains their legend? Over a two-year period from 1932-34, during the height of the Great Depression in America, Bonnie & Clyde evolved from petty thieves to nationally known bank robbers and murderers. Their robbery of banks and store owners, in a rural America ravaged by farm foreclosures and bankruptcies, led to their exploits and relationship being romanticised by a burgeoning ‘yellow’ press. In reality, at the time of their death, their gang was believed to be responsible for at least 13 murders, including two policemen, several robberies and burglaries and assorted kidnappings, abductions and woundings. 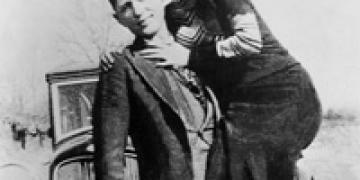 Slender and only 4 foot 11 inches tall, Bonnie Parker was the middle of three children born to a poor Texan family. In January 1930 when she met Clyde Barrows and became linked as his companion, Bonnie was 19 and working as a waitress to support herself. Her husband of the preceding 3 years, Roy Thornton, was in prison for murder. They never divorced. Although certainly a supporter of Clyde and his gang, by the time of her death, there were no outstanding warrants for Bonnie’s arrest alleging murder. There is in fact little reliable evidence that she ever shot anyone, but by the time of her death in 1934, her fate had been inextricably linked with that of her companion Barrows. When Clyde met Bonnie in January 1930, he was 21 and single. The fifth of seven children born to a poor farming family in Texas, he and his brother Buck supported themselves as petty thieves. Soon after meeting Bonnie at a mutual friend’s home, Clyde was sent to jail for burglary. He’d obviously made an impression on Bonnie, as she smuggled him a gun and aided his escape. Upon his re-capture, he was jailed for two years. He was eventually paroled in February 1932 and reacquainted himself with Bonnie. Until this point, Clyde had been largely involved with low level, opportunistic crime. However, Texas State Prison appears to have changed him. It was during his incarceration that he allegedly killed another prisoner who had beaten and raped him. By the time of Clyde’s release in 1932, he was a hardened man.